Summer is a time to enjoy fresh fruit. Whether Hawaiian pineapple, whose season ends in July, papayas, or melons, which are the true fruit of summer, fruit goes well with summer grilling. This is a simple idea for twist on serving fresh fruit during the summer. 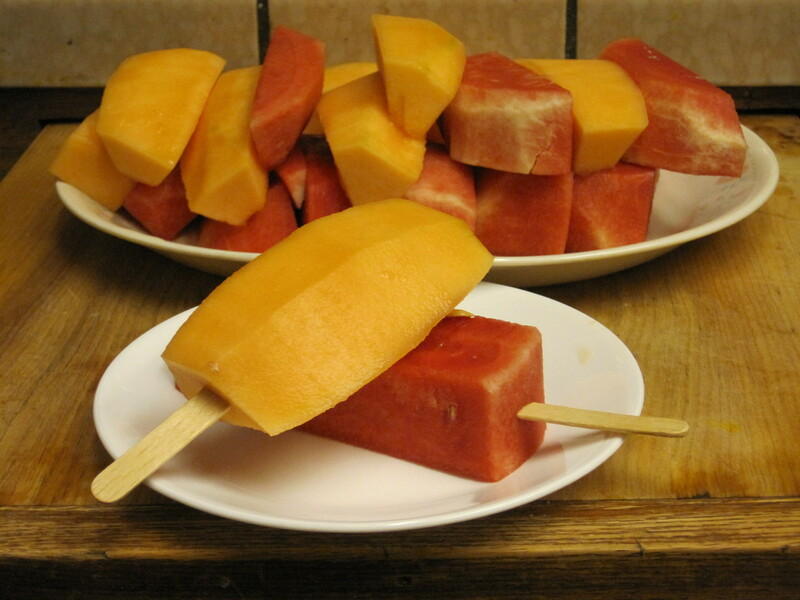 Insert food grade popsicle sticks into wedges of fresh fruit and serve them chilled or frozen. Simple, healthy, and portable, this figure friendly treat is certain to be a hit with your friends and family. 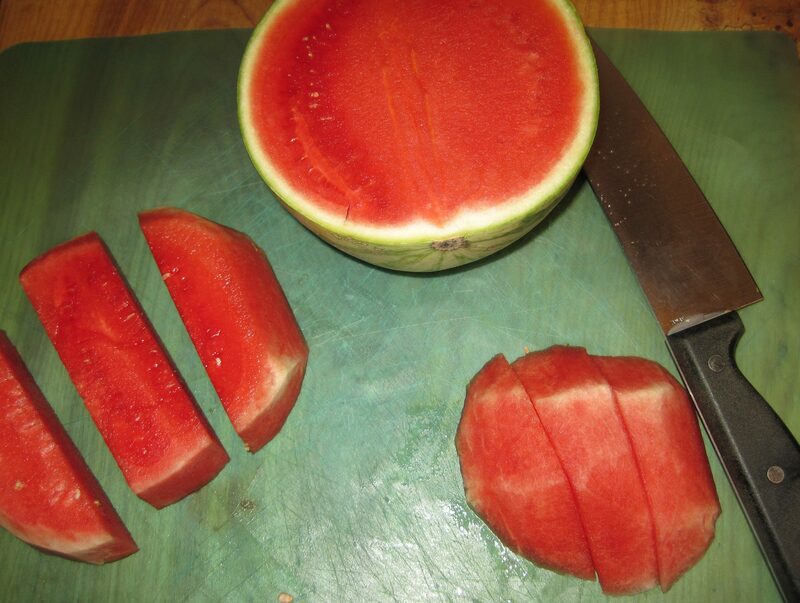 Simply cut your fruit into slender wedges. Insert a food safe popsicle stick. Then arrange the fruit on a plate or platter for serving. 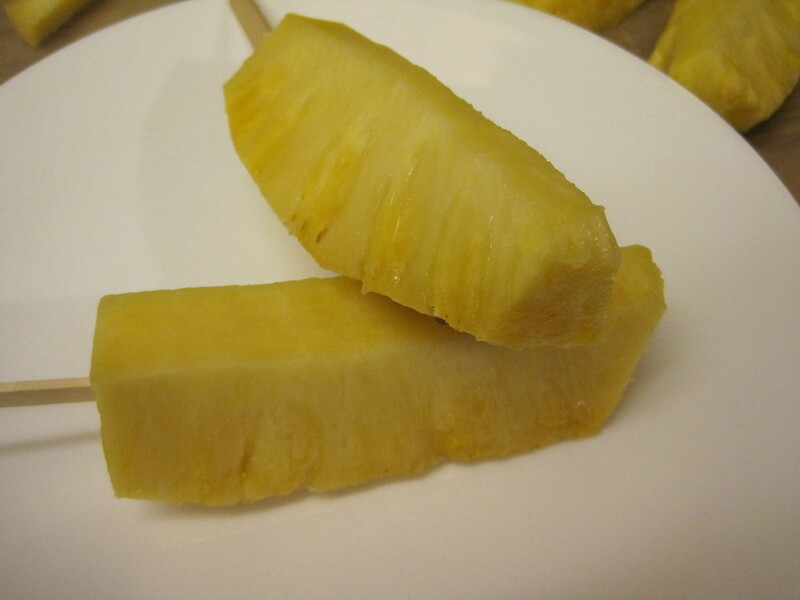 These photos show melon, but this technique works well for pineapple, too. 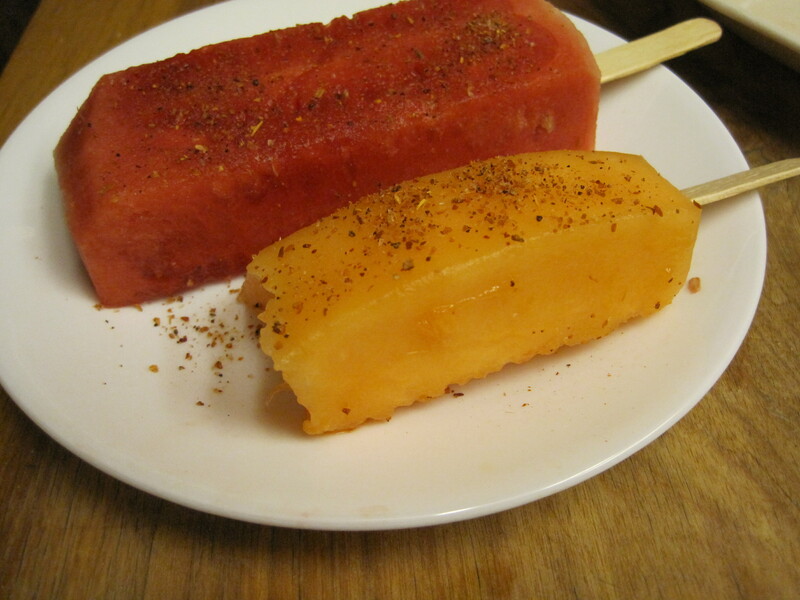 To add a little kick, serve your fruit wedges with a side of Tajin or Cielito seasoning and some lime wedges. Your guests can add this to the fruit according to their individual taste. Once again, a bite has been taken from my subject matter before the photograph was taken. 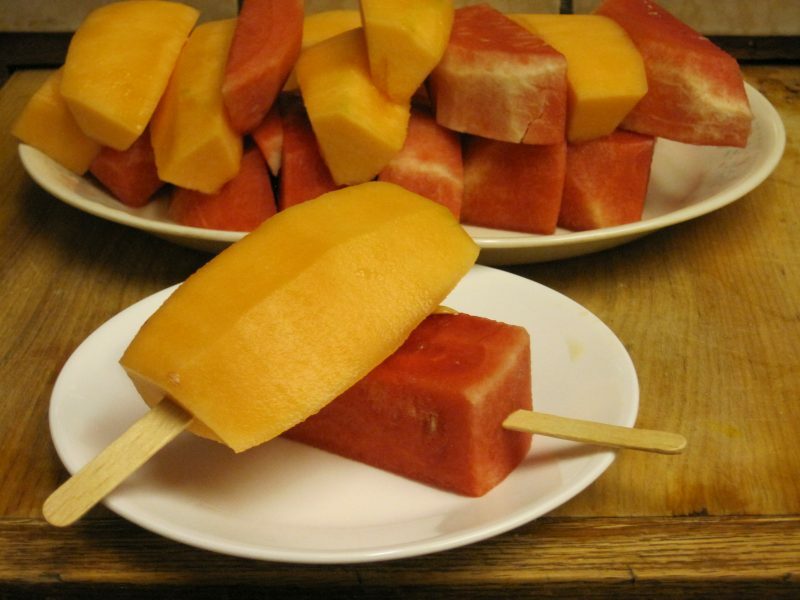 Notice the rough edge on the cantaloupe pop, I wonder what could have happened. Surely, Sue Chef and Baker’s Man are innocent of any wrong doing. I must have mice. You can also freeze these fresh fruit popsicles in a covered container until serving time to give your guests, or your children, a healthy frozen treat. Watermelon wedges work particularly well as a frozen treat. Here are the printable instructions. 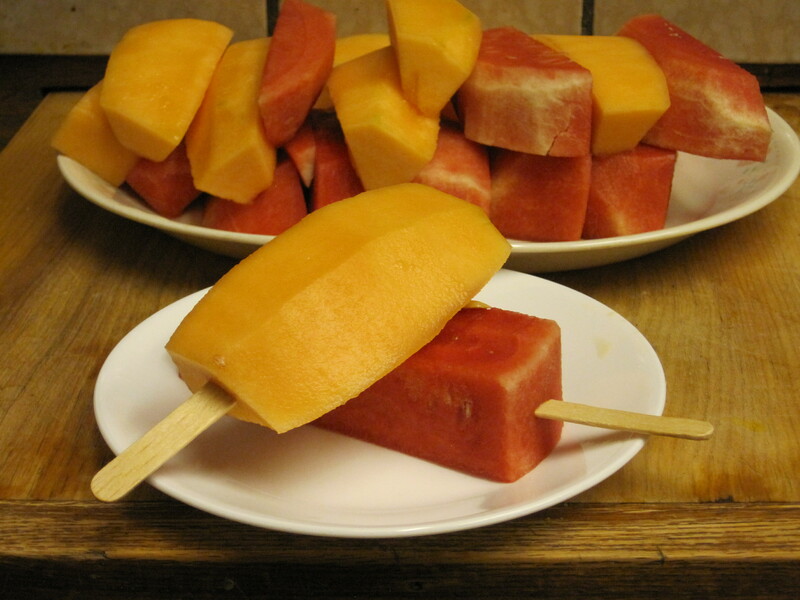 Inserting popsicle sticks in melon wedges makes the perfect portable food for summer barbecues. 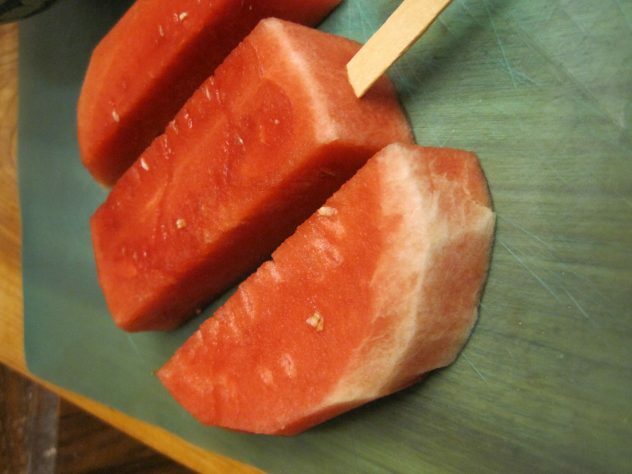 Freezing wedges of watermelon, or other fruit, makes the perfect healthy popsicle for kids and adults alike. Once fruit is cut, insert a popsicle stick half way into one end of the fruit. Arrange fruit on a platter and serve with optional lime wedges and chile seasoning on the side. Optional: Freeze some of the fruit wedges and serve them as frozen treats. Watermelon works well as a frozen treat.